Home Articles Legal Articles Legality of Advocates boycotts court work. Legality of Advocates boycotts court work. Hitherto it was just a notion that sections of country’s lawyer community go on a strike paralyzing the functioning of courts at the drop of a hat citing even frivolous reasons. But now, the country’s Law Commission confirms it. The law panel headed by retired Supreme Court judge Justice Balbir Singh Chauhan in its recent report to the government calling for amendment of the Advocates Act to discipline striking lawyers noted that the reasons for strike call or abstinence from work varied from local, national to international issues, having no relevance to the working of the courts. Arisen above the report received from chief justices of various states, the report itself mentioned a few reasons – bomb blast in Pakistan school, amendments to Sri Lanka’s Constitution, interstate, to show solidarity to advocates of other State Bar Associations, moral support from brawl by social activists, heavy rains, or on some religious occasions such as shraadh, Agrasen Jayanti, etc. or even for kavi sammelan. Most lower courts in the country, especially in North India could only work on an average for 150 days only in a year. Lawyers’ agitation affected several HCs too. This is at a time when the overall case pendency in the country stood at a staggering 3.5 crore, including 2.46 crore cases in subordinate courts and 45 lakh cases in HCs. The father of the concept of “the right to work” is said to be Charles Fourier (1772-1837) a Frenchman who declared that “Politics extol the rights of men and do not guarantee the prime and only useful right, the right to work.” This statement marks the origin and establishment of the “right to work” as a political concept. The right to work, as a human right, is provided for in several international documents. Though not expressly stated, it was implicit in the two basic texts of the International Labour Organisation (ILO), namely, the Constitution of 1919 and the Declaration of Philadelphia of 1944. The right to work is included in the Universal Declaration of Human Rights (1948) and the International Covenant on Economic, Social and Cultural Rights (1966). Article 1 of the ILO Employment Policy Convention, 1964 (No. 122) states: “Each member shall declare and pursue as a major goal an active policy designed to promote full, productive and freely chosen employment.” This Convention is among those which have received the largest number of ratifications. Among other things this policy aims at ensuring that “there is freedom of choice of employment”. Right and Duties of Man (1961) (ii) The European Social Charter (1961) and (iii) The African Charter on Human and Peoples’ Rights (1981). According to the Universal Declaration of Human Rights and the International Covenant on Economic, Social and Cultural Rights everyone is entitled to the right to work. It can only be guaranteed in conditions of full employment, the importance of which is acknowledged by the Declaration of Philadelphia and the United Nations Charter. In India with reference to “right to work”, there are two decisions of the Apex Court which have taken different views. The first decision was handed down in Delhi Transport Corpn. v. DTC Mazdoor Congress1 The second is the one reported in Delhi Development Horticulture Employees’ Union v. Delhi Admn.2 In the first case, the Apex Court has held that income is the foundation of many fundamental rights and when work is the source of income, the right to work becomes as much fundamental. In the case of Delhi Development Horticulture Employees’ Union 2, a two-Judge Bench has observed that this country has so far not found it feasible to incorporate the right to livelihood as a fundamental right in the Constitution. Disputes Act, 1947 would reveal that workers have no absolute right to go on strike. Section 22 of the Industrial Disputes Act, 1947 lays down circumstances in which strike in public utility services is prohibited. Under Section 23 there are restrictions imposed on workmen from going on strike in the circumstances enumerated therein. Section 24, on the other hand, lays down that a strike shall be illegal if it is commenced or declared in contravention of Section 22 or Section 23 or is continued in contravention of an order made under sub-section (3) of Section 10 or sub-section (4-A) of Section 10-A. It is regarded as a powerful weapon for collective bargaining though. If we look into the provisions of the Advocates Act and the Legal Practitioners Act, it becomes evident that the position of advocates is quite different from an employee. An advocate is a person learned in the law and duly admitted to practice, who assists his client with advice and pleads for him in open court. It is the professional body of lawyers – the Bar Council of India which lays down standards of professional conduct and etiquette for advocates to safeguard the rights, privileges, and interests of advocates. A Code of Ethics for the legal profession in India was framed as early as 1962. It details the duties of advocates. Bar Council of India has also framed rules in exercise of its rule-making power under the Advocates Act, 1961. Chapter II of Part VI of these “Rules Governing Advocates” prescribe standards professional conduct and etiquette for lawyers. The Preamble to these Rules states the duties and obligations of lawyers in general terms. Rules I and II of Chapter II of the rules lay down standards of professional conduct and etiquette and duties to the client and to the Court. Rule 12 provides that an advocate shall not withdraw from engagements once accepted, without sufficient cause and unless reasonable and sufficient notice is given to the client. Rule 15 provides that it shall be the duty of an advocate freely to uphold the interests of his client by all fair and honorable means without regard to any unpleasant consequences to himself or to any other. Rule 24 lays down that an advocate shall not do anything whereby he abuses or takes advantage of the confidence reposed in him by his client. The rights and privileges of an advocate carry with them the corresponding duty not to abuse them. Thus when an advocate accepts a brief it is his bounden duty to attend to his client’s interest with due diligence and if he fails to do so, he is likely to be dealt with for neglect and is also answerable to the client. If he is unable to attend when the case is called, he is bound to make some other arrangements for the proper representation of his client or the brief should be returned in good time. In short, the advocates owe a duty not only to their clients but also to the court and are bound to cooperate with the court in the orderly administration of justice. It is in this background that one has to look into the problems created by lawyers’ strikes. The questions usually raised are: Can we afford lawyers’ boycott of courts any more? 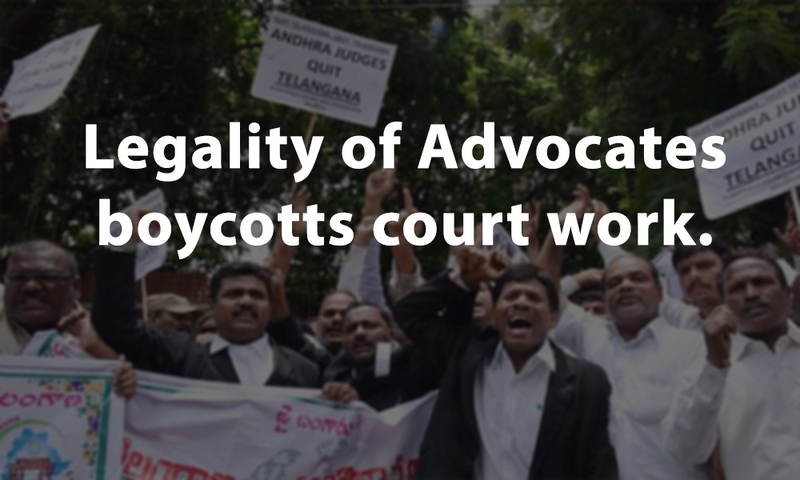 Whether lawyers’ boycott is justified? Who suffers the most on account of the boycott? Amongst various duties required to be discharged by the lawyers, one of the duties to the court is that an advocate shall maintain towards the court a respectful attitude bearing in mind that the dignity of the judicial office is essential for the survival of an independent judiciary, and thus of constitutional Government. The court has also a reciprocal duty to perform and should not only not be discourteous to a lawyer but should also try to maintain respect in the eyes of his clients and the general public with whom he has to deal in his professional capacity. Hypersensitiveness on the one side or rudeness on the other must be avoided at all costs. Both the Bench and the Bar are the two arms of the same machinery and unless they work harmoniously, justice cannot be properly administered. The need for mutual understanding and respect between the Bench and the Bar was emphasized by many a writer on the subject.6 When we consider the role of lawyers in the administration of justice, we ought to remember that the profession of law is not a mere trade or business. It is a vocation to be pursued to meet the challenge of times. There is much more in the profession than a traditional dignified calling. In fact, the term “lawyers” refers to a group of men pursuing a learned art as a common calling in the spirit of public service. The pursuit of learned art in the spirit of public service is the primary purpose. In ensuring the rule of law a most significant part is played by the lawyers. It is said that Judges most often shine with the reflected glory of lawyers. In this view it is difficult to concede a right to boycott courts to the lawyers on the analogy of conceding right to strike of employees. Moreover, the right to strike work in India is admittedly not absolute. This is so in the industrial sector as well as in public service sector. The members of the Bar Association thus have no right to boycott courts in view of the duties which they are required to discharge. It is true that under the Constitution of India, freedom of association is guaranteed as a fundamental right, but this right is subject to reasonable restriction in the interest of public order or morality. The prohibition against strikes by lawyers is inbuilt in the Advocates Act, 1961. The duties to the court and duties to the clients prescribed by Bar Council of India go to prove that strike or boycotting of courts is an antithesis to practice in the court, and is professional misconduct. An advocate being an officer of the court and thus bound to submit to its authority cannot join in an action to boycott the court or a particular judge because of any grievance – real or alleged. In this context, it would be worthwhile to examine the judicial decisions on the issue. In Emperor v. Rajani Kanta Bose7 a Special Bench of the Calcutta High Court consisting of three Judges opined that a pleader being an officer of the court is bound to submit to its authority and thus cannot join any action to boycott the court or a particular judge because of any grievance – real or alleged, whether touching the court or of political or other character. The pleader accepting the vakalatnama cannot divest himself of his duties arising from such acceptance without leave of the court. If he desires to discharge himself from a case, he must give his client reasonable notice of his intention. It is not difficult to realise that serious uncertainties and inconveniences might arise in the conduct of judicial proceedings if the appointment of a pleader made in writing and lodged in the court where the case was to be tried could be revoked without the knowledge and sanction of the Court. If the practitioner wants to withdraw he must always give reasonable notice of his withdrawal from the case to his client8 Taking the same line of arguments the Supreme Court also observed that absenting from courts on a particular day in pursuance of a concerted movement on the part of the lawyers to boycott a court amounts to professional misconduct. he Supreme Court has also observed that it is the duty of every advocate, who accepts the brief in a criminal case, to attend the trial from day to day. Having accepted the brief, he will be committing a breach of his professional duty if he so fails to attend. This view of the Supreme Court is in consonance with the views of the Indian Judiciary for the last several decades. The Calcutta High Court adopted this view as early as 1923 in Tarini Mohan Barar case10, In that case, a decision to boycott the court was in issue. A resolution was passed by the Bar Association not to appear before the Fourth Subordinate Judge in view of the fact that insult inflicted on Pleader Shri Babu Rabindra Nath Chatterjee, was an insult to the whole Bar. It was in consequence of the resolution that the pleaders refused to appear before the Subordinate Judge. The High Court ruled: “The pleader has duties and obligations to their clients in respect of the suits and matters entrusted to them which were pending in the Court of the learned Subordinate Judge. There was further and equally important duty and obligation upon them viz. to cooperate with the Court in the ordinary and pure administration of justice. By the course which they have adopted, the pleaders isolated and neglected their duty and obligation in both these respects. We desire to make it clear that such conduct cannot and will not be tolerated. In this case if the pleaders thought they had a just cause of complaint, they had two courses open to them either to make a representation to the learned District Judge or to the High Court. They took neither of these alternatives, but they adopted the high-handed and unjustifiable course of boycotting the learned Subordinate Judge in court”. The same view was expressed by the Punjab and Haryana High Court in Maharaj Baksh Singh11 A Division Bench of the same High Court has in Rajinder Singh v. Union of India12 observed: “What legal sanction the Association of Lawyers has to give call to the lawyers to go on strike is beyond our comprehension. The fear in the lawyers as is being projected by Mr Saini, not to argue the case of being punished by the Association for his appearance in Court on account of the call given by the Association to go on strike or in other words to abstain from appearing in Court, has no legal basis. The functioning of the Courts in the matter of administration of justice is not to be regulated or controlled by the Association of lawyers, in the manner of giving calls to its members to go on strike and not to appear in Courts in their cases, which is not legal when such association of lawyers have no arrangement for providing work (judicial work) to its members for their livelihood, how such calls are given for strike by such associations. Further comments can only be given as and when action of any Association in imposing penalty on a lawyer is challenged in any Court. If the position is examined from a different angle, the result would be alarming. The primary function of the Court is to administer justice to and between the parties approaching Courts. The Courts would be failing in their duties in not performing such a function merely on the ground that lawyers choose to abstain from appearing in Courts. The Judges are supposed to train themselves to decide cases by studying the pleas and the law on the subject even if unaided either by the parties or their counsel. There is no legal impediment in the way of the Court not to administer justice when lawyers abstain from appearing in Courts or they appear but refuse to assist the Court in the administration of justice. Code of Civil Procedure contains provisions for proceeding with cases where parties fail to appear.” A Division Bench of the Allahabad High Court has also ruled on 22-7-1994 that lawyers have no right to go on strike. Thus the courts are unanimous in their verdict that deliberately absenting from court is unprofessional and unethical and there is no legal basis behind the strike commenced pursuant to the passing of resolution by the Bar Association when such association of lawyers have no arrangement for providing work to its members for their livelihood. Let us now examine the legal implication of a lawyer’s accepting a brief. An advocate does certainly undertake a duty on his client’s behalf, but by accepting the brief, he enters into a contract, express or implied, with his client. He is deemed to have taken on himself a duty in the proper discharge of which, not only the client but the court and the public at large have an interest. Lawyers have extensive discretion as to the mode of conducting the case for his client. Various provisions of the Advocates Act, 1961 make it evident that an advocate is not an agent or power of attorney holder. The jural relationship between him and his client is not founded so much on a contract as from his status. His status is above a servant or an agent. He holds a position of trust and even above it. As members of the Bar, lawyers no doubt have their importance and role in the society and, therefore, cannot be expected to stand mute to the events around them but as right thinking members of the society they cannot be expected to countenance any action on their part which could in any manner compromise their duty to the court and responsibility they bear towards those they have undertaken to represent. The members of the Bar are required to assert their just rights to be heard, without failings in respect to the Bench. They should be fearless and independent in the discharge of their duties. And in case if the advocate himself is improperly dealt with â€” he should vindicate the independence of the Bar. The Bar Association should seriously discuss the issues involved in boycotting the courts, for the purpose of protecting the rights of the litigants and to carry out the objects underlying Articles 22 and 39-A of the Constitution of India and evolve other legal appropriate measures as an alternate to strike to seek redressal of grievances. The earlier the better.